Want to engage more supporters and generate more funds at your next fundraising event? Consider adding a Winner’s Choice Raffle option to your Live Auction. What is a Winner’s Choice or Golden Ticket Raffle? A Winner’s Choice Raffle also known as a Golden Ticket Raffle allows the holder of the winning ticket the opportunity to select a prize of their choice from a specified group of your live auction items. Tickets are sold for a much lower fee than the live auction value, allowing entry for all interested guests. How does the Winner’s Choice Raffle work? Quite simply, you select a few items from your live auction inventory that will be designated for the Winner’s Choice Raffle. The set up would be similar to a traditional raffle where you sell chances or take donations for an opportunity to win a desirable prize. At a predetermined time before or during your live auction, a ticket is drawn and the winner then has the opportunity to choose the prize of their choice from the list of prizes. The remaining prizes are then sold in the live auction. You will want to select items that are desirable, but at a price point that you can expect to exceed the highest likely price from the live auction in ticket sales revenue. For example, if you choose 3 items from your live auction list for the Winner’s Choice Raffle and the approximate value you would receive on each in the live auction is about $1,000, then you need to sell a certain number of tickets at a price to surpass $1,000. Ideally, you want to set your goal at an amount that is at least double, if not more than the auction value. To generate $2,000 in revenue, 200 tickets would need to be sold for $10 or 100 tickets for $20. Note that if you choose to limit the total number of tickets sold, you can set a higher ticket price and create some purchasing frenzy. When pricing your tickets keep in mind your audience, what they are willing to pay and the number of supporters you are likely to attract. Why the Winner’s Choice Raffle is an effective revenue enhancer. While live auctions bring in a large portion of a fundraiser’s revenue, they also tend to cater to guests with larger spending budgets. A Winner’s Choice Raffle component can attract more participation and interest for your event and live auction segment. Guests that may not have had the means to bid on a live auction item, now have the opportunity to win one of the sought after items and further support your cause. 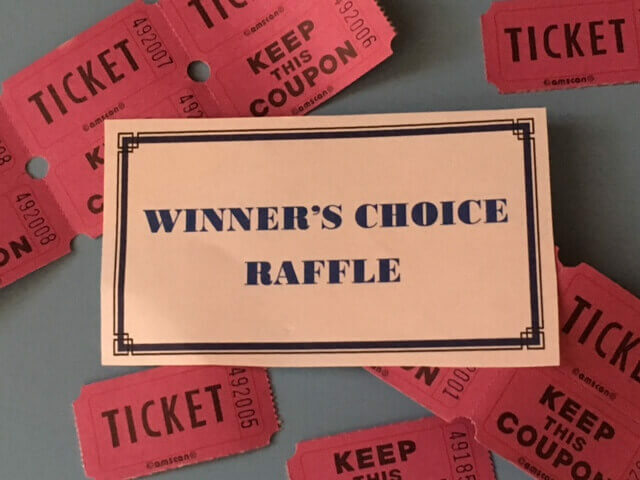 The Winner’s Choice Raffle revenue booster idea is an exciting and inclusive opportunity for your guests to participate in, join the fun and feel part of the fundraising! Like with all raffles you should check with your local and state laws before holding a winner's choice raffle. There are often forms or paperwork you need to fill out at the state or county level. Some types of organizations are restricted on the number of raffles they can hold. Before you decide to host a raffle, check the raffle laws in your state. Some states do not allow raffles at all or require certain permits that must be applied for in advance.